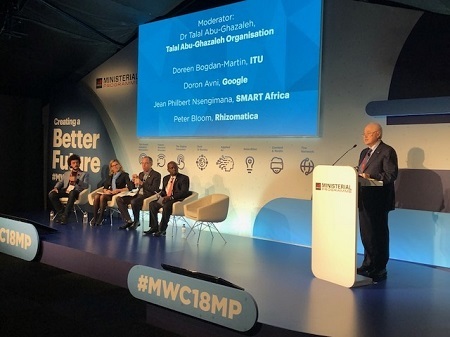 BARCELONA - HE Dr. Talal Abu-Ghazaleh, chairman of Talal Abu-Ghazaleh Organization (TAG-Org) stressed on the need to embrace the Power of Mobile and modernize policies in order to create a better future for the next generation. In his opening speech as Chair of the session on Educate to Innovate at the Mobile World Congress 2018 which was held at Fira Barcelona Gran Via, Dr. Abu-Ghazaleh began by applauding the three themes of the conference, “Creating a better future”, “modernizing policies for the Digital Era”, and “Power of the Mobile”. More than 108 thousands from 208 countries attended the event which witnessed the participation of over 2300 companies at the exhibition that was organized at the Congress, as well as the participation of more than 10 thousand attendees from more than 400 mobile operators worldwide. Dr. Abu-Ghazaleh later stated that TAG-Org has adopted comprehensive strategies which focused on the same themes of the Congress seeing as the future is based on the fast development in the technological field. Talal Abu-Ghazaleh University College, Applied College for Business and IT (taguc.com), which provides education through innovation and will open its doors September 2018. Talal Abu-Ghazaleh Digital University (tag-du.com): MOOC-based academic degrees. Talal Abu-Ghazaleh International University (tagiuni.com): which provides online degrees and diplomas; in our strong belief that education is the key to a better future," he said. BETWIXT: how Internet can be used to change society not how to use devices. (betwixt.us) "A company of clever, well-informed people who have a great deal of conversation is a company that captivates, motivates and innovates. Good conversation helps us think and rethink, charge up and wind down, evolve and invent and this is what BETWIXT is all about." "We are also following our TAGITOP, the first affordable laptop which was and still is a success due to its functionality, technology and affordability with even another amazing product which we called as a project the Talal Abu-Ghazaleh Digital Citizenship Smart Gadget (tag-dc.com) a Phablet like no other," he added. Dr. Abu-Ghazaleh gave a brief on the unique concept of youth, the Talal Abu-Ghazaleh Knowledge Society (tagks.com) which provided youths with free Internet access, training courses and a research center, in addition to Talal Abu-Ghazaleh Encyclopedia (TAGEPEDIA) (tagipedia.org) which will be launched in December 2018 with over 1,200,000 articles in Arabic to enrich the Arabic content online. HE Dr. Abu-Ghazaleh who chaired the UN ICT Taskforce and UN Global Alliance for ICT & Development stressed on the fact that TAG-Org and all its 100+ offices around the world follow the latest technology trends as per the policies regarding the future expansion and communication strategies. Dr. Abu-Ghazaleh moderated a Panel discussion entitled "What steps can ICT take to support future education?" in which leading policymakers, regulators and senior representatives of the mobile industry attended. The Panel tackled how the digital ecosystem can collaborate to increase locally relevant content and support future education? And examine how ICT is opening new markets to the benefits of education and the digital economy? 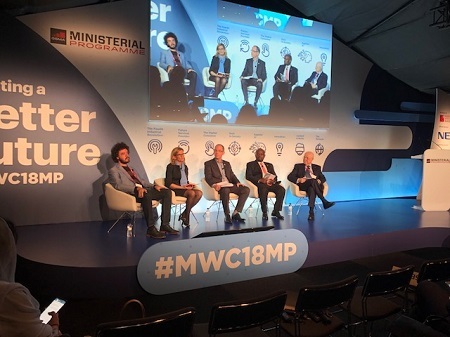 The Talal Abu-Ghazaleh Academy (TAG-Academy), a provider of training solutions and professional training in more than 20 sectors and through 300-plus training programs signed a Memorandum of Understanding at the Mobile World Congress 2018 with the GSMA, an organization representing mobile operators worldwide, agreeing to cooperate on a number of joint initiatives including translating GSMA courses into Arabic and offering them to clients internationally as well as promoting the GSMA’s courses through over one hundred TAG-Org offices worldwide. The two parties will also conduct marketing and business development activities, workshops and seminars in addition to collaborating on technology white papers(an authoritative guide or report that explains the benefits of a particular technology, product or policy), research and other activities related to promoting mobile technologies to bridge the digital divide.